Units, battles, and sides can be boosted, shifting odds in one's favor. Units are the easiest. Sides are the hardest. According to Clay Dice, Luckamancy does this by "steals Numbers from the world". That is, it improves the "rolls" of the boosted Units while reducing unboosted Units' rolls, the average odds (Mathamancy) staying the same. It usually does not go very far when stealing the numbers often coming from their own side. Clay Dice states that it cannot steal from the side the Luckamancer is opposing, however, unless the end result sees the enemy side rolling better than they otherwise would. Can do the reverse of boosting luck, cursing a unit to suffer against one's odds. This would increase the odd's of the rest of the side. Parson claimed to have tried to cast Luckamancy Erf-b1-p129 before sending on Bogroll on a special mission, but he stated that he failed. This may have been meant metaphorically. Contrariwise, presumably Parson's dose of Luckamancy stole numbers from other Gobwin Knob units, contributing to their demises — including that of Bogroll. Could a Luckamancer assist in item creation and possibly make it better than it would normally be? The involvement of a Luckamancer conceivably might make the linking and unlinking of casters easier. Luckamancy is usually used to succeed at important actions at the expense of failing at other actions. It might be possible to use the reverse tactic, namely, apply bad luck to unimportant actions or even no action at all so as to save up more good luck for later and make the bad luck better targeted at things that don't matter. 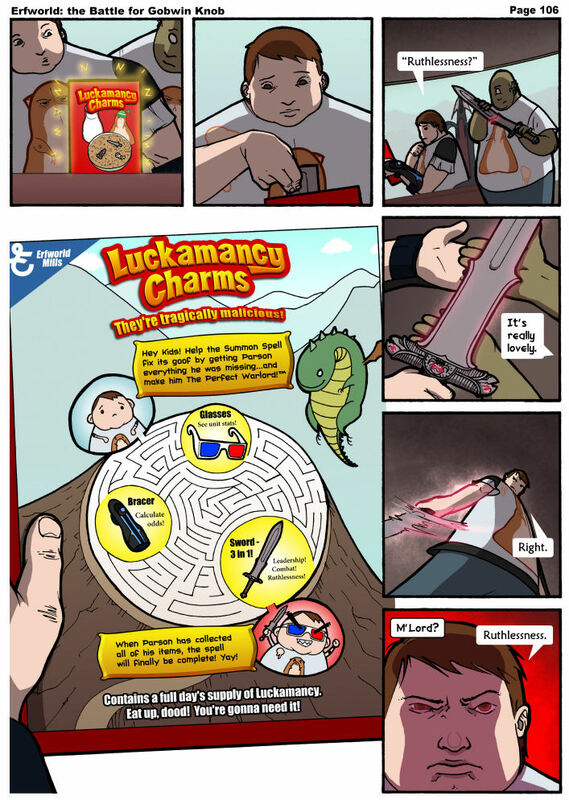 Note how Forthewin was supposed to have legendary Luckamancy until his death. His adjutant, Artemis, clearly had legendarily poor Luckamancy. Per Clay's explanation, could Forthewin's luck have been stolen from Artemis? Luckless Elves may have an odd form of Natural Luckamancy, stealing their own luck and giving it to their allies. Blind Luck is mentioned in IPTSF Text 29, hinting that there it is a kind of Luck that blinds one's enemies to your actions, and perhaps, to your movement. When Artemis fights against Sylvia, Artemis notices the particular luck of her knights. It is possible that this luck was the balance to the fortuitous situations that prevented Artemis from harming Sylvia, since Sylvia was fated to die in a fire. This page was last edited on 12 December 2015, at 20:15.